One million Compassion cards given to strangers by October, 2010. COMPLETED! Two million Compassion cards given to strangers by October, 2011. COMPLETED! Compassion Cards delivered by Earth's Compassion Team to leaders around the world. In Process! "If one million made a scratch in the world, ten million will make a dent!" Next Challenge: Ten million Compassion cards given to strangers. In Process! Over six million cards have been printed, so far! The original challenge was far surpassed. One million cards were in circulation within six months. 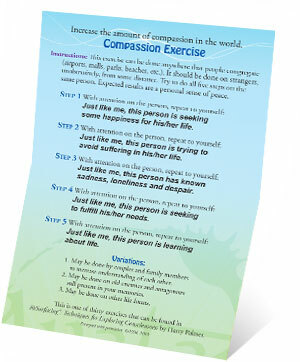 By October 2011 two million Compassion cards had been distributed in 72 countries. Now we are well into distributing six million cards to all corners of the world on our way to ten million cards given to strangers. 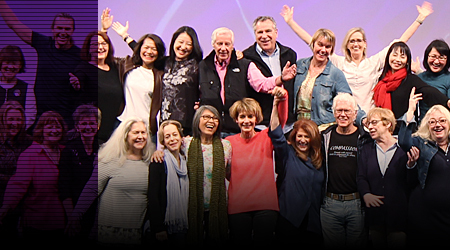 As the Compassion Project moved ahead, a new and exciting opportunity to rapidly increase compassion evolved — Earth's Compassion Team. The team's goal is to give Compassion Cards specifically to world leaders. Over 207,600 Compassion cards have been delivered by Earth's Compassion Team to top leaders in 12 countries. The response has been very positive and encouraging. There is more to do. Together we can create the synergy to make it happen. We need another miracle moment in which everyone realizes that we're in this all together, and that the earth is the only spaceship that we get. Star's Edge has laid the foundation. Future generations need to direct their greatest efforts toward coming together; the world needs less superpowers and more friendly tribes. The solution that we've been looking for is more alignment and cooperation, more attention on service to others. We need to become citizens for the planet. Have you ever felt the warmth of the morning sun on your face? That's what the broadcast from infinite being feels like, it inspires goodness, and love, and compassion. And it brings tears to the eyes, and compassion to the heart. The Compassion cards make perfect thank you notes and are great for introductions with your business card inserted. Each card contains THE COMPASSION EXERCISE from the book ReSurfacing®: Techniques for Exploring Consciousness by Harry Palmer. Cards are currently available in 36 languages: Albanian, Arabic, Catalan, Chinese, Croatian, Czech, Dutch, English, Farsi, French, German, Greek, Hebrew, Hindi, Hungarian, Icelandic, Indonesian, Italian, Japanese, Korean, Macedonian, Maori, Norwegian, Polish, Portuguese (Brazil), Portuguese (Portugal), Romanian, Russian, Serbian, Slovenian, Spanish, Swedish, Thai, Turkish, Urdu and Vietnamese. 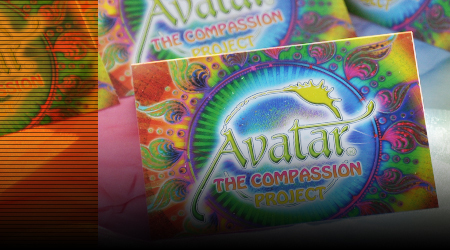 If you would like to help distribute Compassion Project cards, you can purchase them at the Avatar Bookstore or call us at 800-589-3767. Packs of 50 cards are $5.00 USD.